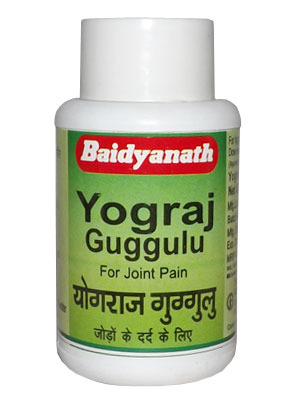 Yogaraj Guggul is a traditional Ayurvedic formula designed to reduce excess vata in the joints. Guggul is a collective name of various gum resins extracted from trees according to the Ayurvedic Science. Yogaraj Guggulu contains a synergistic blend of detoxifying herbs, including triphala, chitrak and vidanga, that work in conjunction with guggulu to remove excess vata from the joints as well as the nerves and muscles. This purifying and rejuvenating compound is used traditionally to treat inflammatory conditions, such as Osteoporosis, Bone Density, arthritis, especially rheumatism and gout. 2 tablets twice a day with luke warm water.